The Buccaneer is a splendid facility with massive outdoor terraces, incredible lighting, great sound systems and gorgeous landscaping of blue skies with breathtaking views of the Caribbean Sea. It is the perfect place to create the ideal tropical setting for your special wedding or event. We will help you coordinate any type of wedding or events: personal celebrations of first time marriages, re-marriages, vows renewals, birthdays parties, fashion shows, commercial or promotion events, product launches, music concerts or trade fairs, sales meetings and seminars. Whether you’re planning an intimate ceremony with just your family or a large commercial affair, please reserve one of our indoor or outdoor venues. The Buccaneer is a waterfront facility with the perfect space to organize your ultimate destination wedding. Choose from romantic packages thoughtfully designed to make the very most of your time together. We have a full service bride dressing suite with bathroom, ensuring that the wedding party can be completely private prior to the ceremony. When it’s time for the grand entrance, a processional passage from the wedding suite leads the way to the outdoor venue, creating a once-in-a-lifetime experience. The Buccaneer offers a beautiful and romantic location in an authentic Caribbean setting under the moonlight and vibrant Caribbean stars, creating a perfect backdrop for a sunset wedding ceremony. Local chefs can offer succulent cuisine and a local bartender, at the outdoor bar, can offer delicious exotic drinks. Music and dancing can be enjoyed in the open-air terraces. 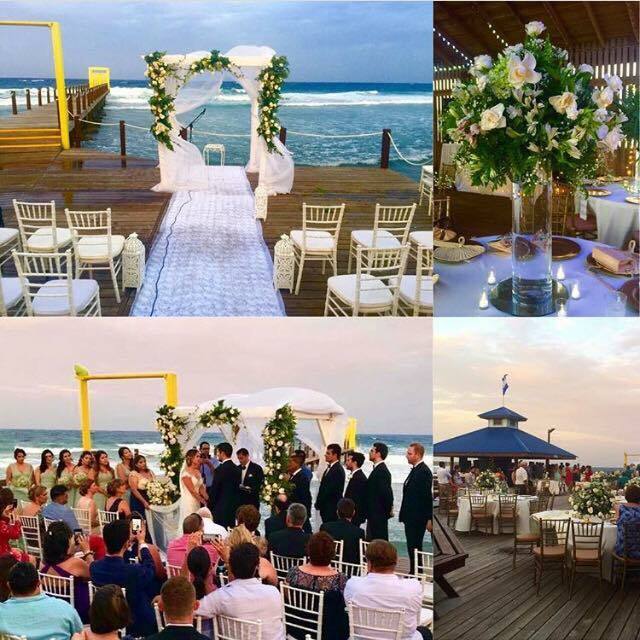 Say “ I DO“ with paradise as your backdrop! Wedding Requirements: Each partner must bring a valid passport, a birth certificate copy, police records and an affidavit of single status. Fees vary depending on where the knot is tied, but all ceremonies require two witnesses. To make the vows valid back home, the lawyer who performs the ceremony must send the marriage certificate to the U.S. embassy in Tegucigalpa. For more information, visit: www.letsgohonduras.com. The Buccaneer offers full consultation and coordination for any type of wedding and anniversary occasions. We offer already-made wedding packages and pay great attention to detail. Our specialty is creating a one of a kind experience in our stunning open decks or indoor venues. Our facilities boasts two kitchens for catering services, rental chairs, tables and decorations, we can fulfill all your total event needs. Our indoor and outdoor spaces can accommodate from 35 up to 200 guests. Please contact us by either email or phone and we will gladly setup an appointment or schedule a call to get started planning the wedding or the event of your dreams.